A conversation with God can happen through prayer, supplication, certain devotional practices, meditation, visualization, and other traditional means. 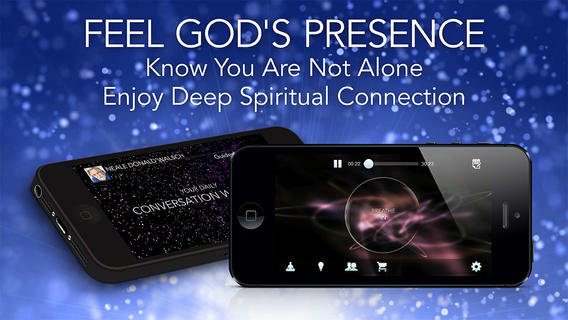 But now, for the first time, advanced mobile technology offers you the opportunity to have your own Conversation with God whenever you wish... right on your iPhone or iPad. Far more than just another guided meditation, this app can serve as a life-changing, "whole-body" transformational tool. By combining beautiful animation, soothing hypnosis music and advanced brainwave technology, the app helps slow your breathing and calm your body's stress chemistry, gently guiding you into a deep state of relaxation, from which you can absorb the spiritual messages you're hearing not just with your ears, but with your entire being.